.......53 Buddhas and Me .................My Life Adventures.....: "Birthdays"
Last night I went to one of my good friends 60th birthday gathering. Robyn decided rather than have a big night sh e just wanted to spend the evening with her girlfriends. So we all had a fun night with Alice and my PUNCH, KARAOKE, GREAT FOOD, LOTS OF LAUGHS. I really love to make gifts for my friends as I can really put my heart into their gift. 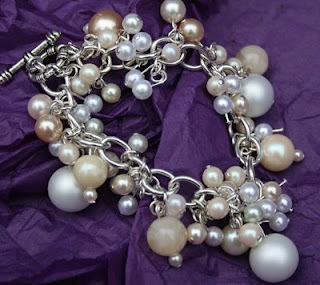 For Robyn I made her this pearl bracelet. I am really pleased with how it turned out and it really suited Robyn. I have decided I am going to start my own small business and sell some of my jewellery. I think it is the time in my life where I start doing things I really want to do and not so much of what I have to do. Very nice Davine, and good for you to pursue what makes your heart dance. I have found that I used to do things which pleased others, my heart failed to dance until I changed my priorities in life. You go girl! LOVE this bracelet, Davine, and I LOVE the inspiration to have a jewellery business! Darlin, it's fantastic to realise that all life is wonderful when we allow our hearts to dance.